Welcome to the premium place to find the information you need on the Yuma Community! Whether you are searching for a business or looking for entertainment, you can find what you need in our Yuma Community Guide. 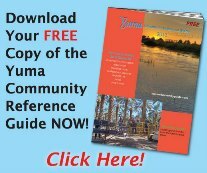 Information from important local phone numbers to golf courses to local attractions, it is all there in the Yuma Community Guide.